First Listen: Thievery Corporation, 'Saudade' In contrast to what often grabs attention in electronic dance music, the duo's seventh album is calm, serene, uncluttered and defiantly warm. 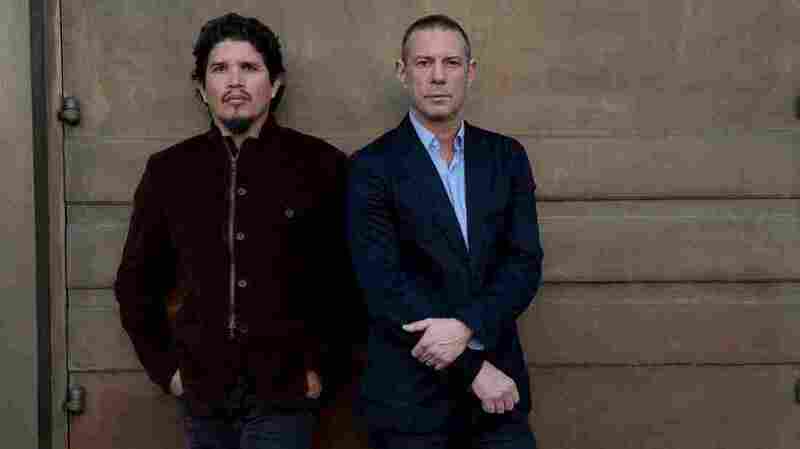 Thievery Corporation's new album, Saudade, comes out April 1. Every language has words and phrases that elude easy translation. In Portuguese, "saudade" (pronounced by Brazilians as "sow-DAH-djee") is one of those. Some musicians equate it with the blues; it's generally associated with melancholy and longing. In its most recent bio, the Washington, D.C., electronic duo Thievery Corporation defines it as "a longing for something or someone that is lost." Though countless songs have "saudade" in the title, the condition of saudade isn't usually conveyed through words. It's evoked. Its wistfulness radiates through every element of the music — from the sound Joao Gilberto makes humming that iconic introduction to "The Girl From Ipanema" to the yearning melody itself to the precise chop of the rhythm guitar behind the voice. You can't just order up saudade. There's no setting for it on a drum machine; no software emulation available. It comes seeping through the music, between the notes, as delicate and evanescent as a May breeze. Thievery Corporation's Eric Hilton and Rob Garza offer a vibey, transfixingly contemporary take on saudade with Saudade, their seventh full-length album. Since 1996's Songs From the Thievery Hi-Fi, which was dedicated to composer Antonio Carlos Jobim, Thievery has explored every square foot of the intersection where bossa nova and electronic sample manipulation meet. The duo has been praised for its sleek acid-jazz dream sequences and frenetic rhythm programming. It's delivered thick instrumental collages dotted with random curio-drawer samples, and also original songs that emphasize live vocals. (The 2000 gem Mirror Conspiracy includes a cameo by the similarly inclined Bebel Gilberto.) The new work is quite possibly the most traditional Thievery release yet: Most of its 13 songs are tightly structured verse-chorus endeavors, with contemplative vocals set against sophisticated chord sequences and minimal acoustic-electric backdrops. In contrast to what often grabs attention in electronic dance music, it's calm, serene, uncluttered and defiantly warm. As on previous efforts, the settings are inviting and sumptuous. Thievery Corporation understands that the sway of Brazilian rhythm is most seductive when it has room to breathe; on many of these tracks, the beats are efficient and businesslike, a mode of transport that never calls attention to itself. This allows the stone-simple melody of "Decollage," one of several tracks featuring the entrancing singer LouLou Ghelichkhani, to simply drift along as if it's floating through clouds. Other tracks, particularly the moody "Sola in Citta" (sung in Italian) and the filmic "Le Coeur" (in French), are deeply textured tone poems on the theme of sensuality; they conjure lazy afternoons in bed, or stolen moments of romance in the jet-set international enclaves of a bygone era. Lounge exotica often devolves into cliché, but not here: Among the messages of Saudade is that the aura of classic bossa nova, circa Astrud Gilberto, shares aesthetic affinities with the pathos of Edith Piaf, the anguish of Cuban bolero, the pillow-talking maneuvers of Serge Gainsbourg — traits that, if handled with sensitivity, can be recombined and re-contextualized in illuminating ways. Where many others treat Brazilian music as a stereotype (generic beach music or foreplay accompaniment), Thievery regards it as something fundamental: a global unifier, an essence that can signify nuanced emotions whether the words are in Portuguese, French, Italian, Spanish or English (all languages represented here). Brazilians talk about saudade as a mood that just comes along and takes over one's emotional landscape, with waves of cascading disappointment melting into wistful, brokenhearted reflection. It's one of those things you feel first, and ponder its component parts later. That can be extremely difficult to translate into music, but Thievery Corporation does just that on Saudade.